The Gujarat high court has asked the two human-rights activists to cooperate and appear when summoned on the embezzlement case against them. 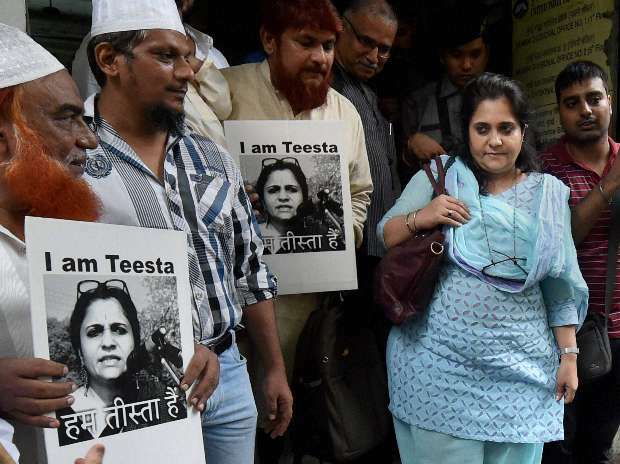 New Delhi: The Gujarat high court allowed anticipatory bail pleas of Mumbai-based activists Teesta Setalvad and her husband Javed Anand on Friday. The two are facing arrest in a case of embezzlement of Central government funds. “I am giving the applicants (Setalvad and Anand) last chance despite all odds. I reserve the right of the state to summon them whenever required. And, the state can seek remand if custodial interrogation is required,” Justice J.B. Pardiwala said, adding that the state can file to get their bail cancelled if the default on these terms. He ordered the couple to remain present before the Ahmedabad Detection of Crime Branch (DCB), which is probing the case, on February 11. The defendants’ lawyer Mihir Thakor informed the court that the two would present themselves on February 15 because of family issues – a request which was granted by Justice Pardiwala. According to the FIR lodged by Setalvad’s former close aide, Raees Khan Pathan, the NGO – Sabrang Trust – run by the couple, had received Rs 1.4 crore fund for education from the ministry of human resources Development for the trust’s “Khoj project”. According to the DCB, the grant received under Sarva Shiksha Abhiyan was transferred to the personal bank accounts of Setalvad and Anand. Pathan had assisted Setalvad while she was active in Gujarat following the 2002 post-Godhra riots where she assisted riot survivors legally. He claimed that the money was used for “personal and political cause”. It has also been alleged that money was spent on witnesses in 2002 riots cases to make false depositions. According to Setalvad and Anand, the Khoj project began in 2010 and had got over well before January 2014 when the bank accounts were frozen due to another case, which they allege is also falsely registered against them. “The only evidence of alleged embezzlement is in the bank accounts. If the accounts in question are frozen, how exactly can they tamper with evidence? This is just a ploy to get police custody,” her organisation, Citizens for Justice and Peace (CJP), had claimed in the statement released soon after the bail was rejected. The couple then decided to approach the high court against the special sessions court order which rejected their anticipatory bail application on May 23, 2018.